The Village of Belcarra, incorporated on August 22nd 1979, is a rural residential community of 700 tucked away on the north side of Burrard Inlet at the mouth of Indian Arm. Surrounded by mountains, forests and a majestic deep-water fjord, Belcarra epitomizes the relaxed West Coast lifestyle, this well-wooded residential community overlooks the magnificent North Shore mountains and the picturesque waters of Indian Arm (which includes Bedwell Bay, Belcarra Bay, Cosy Cove, Whiskey Cove, Farrer Cove & Twin Islands). Belcarra’s current population has been growing steadily at a rate of about 4.5% per year since 1976 and is expected to peak at approximately 800. 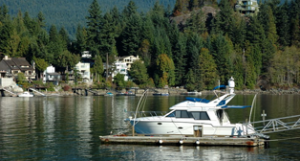 Belcarra is a friendly and co-operative community whose household incomes are amongst the highest in any municipality in the Vancouver region and whose property taxes are relatively low compared to the surrounding neighbourhoods.